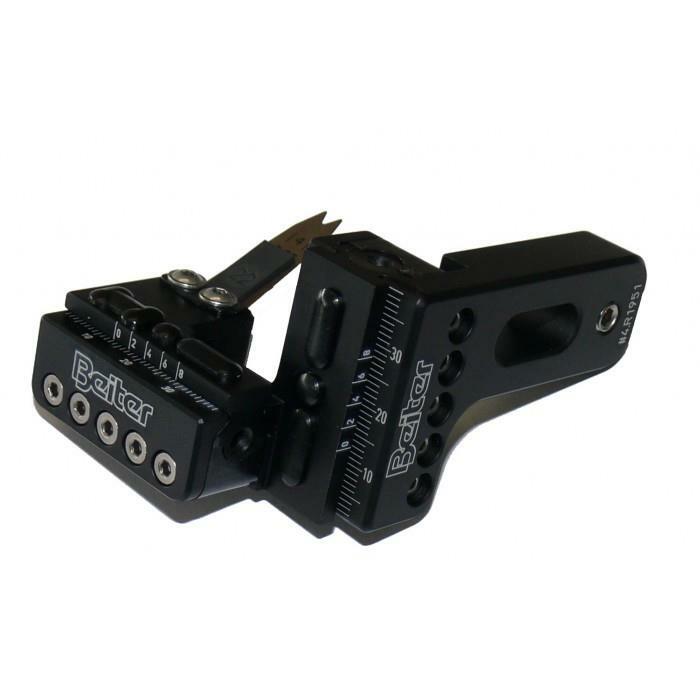 Beiter Compound Arrow Rest K-Archery - Archery Supplies. Recurve and Compound Bow, Arrows, Bow Hunting and Target Archery Supplies. But as soon as you take it in your hands, you will notice, that the weight is relatively low... and it is not an impression. Werner Beiter used thermpolasts wherever possible to reduce weight, but still allowing as much stability as possible. Werner Beiter developed a revolutionary horizontal and vertical adjustment, which allows adjustments precise as 0,2mm: you could move the rest instead of the sight to move your group into the Center! The two Guidance Plates on the Launcher minimize the oscillation of it, while the arrow leaves the bow, but also change the stiffness of the launcher. You have the choice between a Standard version and two OverDraw versions, allowing you 28mm resp. 56mm overdraw (OD88 resp. OD116). - horizontal and vertical movement without any fixation screw. The Rest can be adjusted without loosening or tightening any screw! - highest precision, thanks to a revolutionary concept: the Rest can be adjusted without tolerances and play, with a precision not known until today. - reproducable settings: both the vertical and the horizontal millimetric scale have a Vernier scale (like a caliper). Thanks to that, the Rest can be adjusted with a precision of 0,2mm! The setting can be reproduced, resulting in the arrow rest to have Zero play. - the launcher can be set in 2 different angles - 30° or 35°- by changing two little blocks. So the angles can be re-set precisely. - Guidance Plates with bulge: Plates with different lengths can be installed on top and bottom of the launcher. These will change the stiffness of the launcher and avoid any oscillation after the shot, which most of the time is the reason of bad clearance. The bulge on the plates gives the launcher the chance to follow the horizontal path of the arrow leaving the bow. - Stainless Steel 5/16-24 screw with flat head and large diameter. The Spacer made out of a special plastic allows to fix the screw better. A counter screw with an elastomere pad avoids any marking on the bow handle. - Different Launcher sizes and thicknesses will be available to fit various arrow diameters and weights. for the use on a Hoyt Carbon Matrix or similar bow please use the OD88 version! 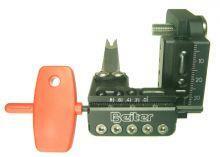 - The left picture shows the Beiter Compund Rest with the adjustment Tool on the horizontal axis. - The right picture shows the Vernier scale which Werner Beiter uses on both the vertical and the horizontal adjustment. - - A Vernier scale is an additional scale which allows a distance measurement to be read more precisely than directly reading a uniformly-divided straight measurement scale. It is a sliding secondary scale that is used to indicate where the measurement lies when it is in between two of the marks on the main scale. When a length is measured the zero point on the indicating scale is the actual point of measurement, however this is likely to be between two data scale points. The indicator scale measurement which corresponds to the best-aligned pair of indicator and data graduations yields the value of the finer additional precision digit. If you have the indicator scale showing an alignement with the 0,4 line and the main scale is at 15mm, than the actual position is 15,4mm. On the picture the position is 15,6mm. - The picture on the low left shows the Guidance Plates and the 35° blocks mounted on the Launcher: by mounting the 30° blocks you can easily and precisely adjust the angle. Guidance Plates are included in different lengths to allow different stiffnesses for the launcher to guide the arrow better on the path out of the bow. Not only: the upper plate also avoids the Launcher to swing back and touch the arrow leaving the bow window. - The right low picture shows the different launcher models available: 4mm,5mm or 6mm wide, 0,20-0,25-0,30-0,35mm thick, available in 2 lengths (long one +15mm only in combination with 20° tilting blocks).